The best time of the year Stampin' Up! year has arrived again! Two whole months of extra free stuff that is only available during the annual Sale-A-Bration promotion. And since we want you to have lots of great ideas for all the new goodies, here we are again with a blog hop featuring the free stuff you can earn with your purchases Jan 28-Mar 31, 2014. 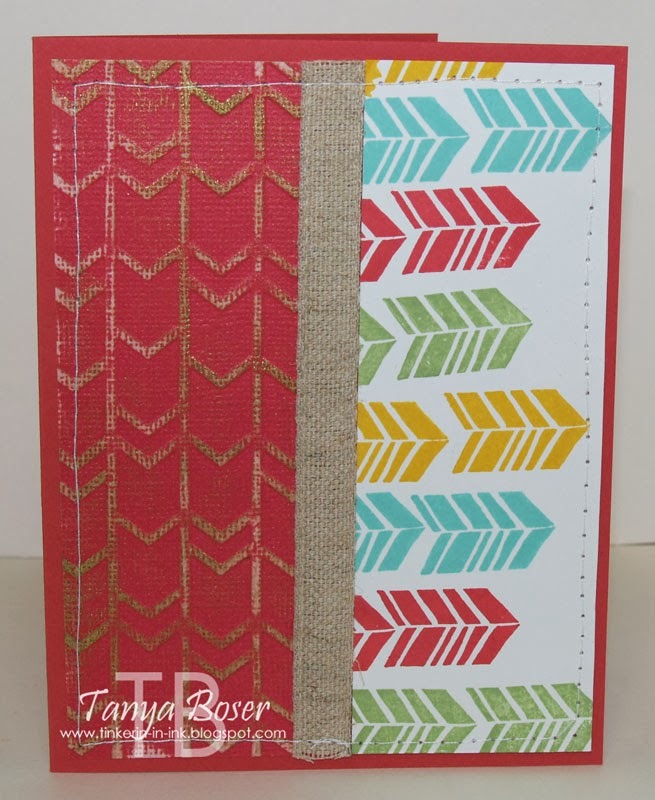 If you get lost, or just want to chat about the awesome hop and SAB freebies, check out this thread at Stampin' Addicts. I have the luck and the honor to be the fist stop on this hop, but if you started somewhere in the middle, you probably arrived here from Holly Krautkremer's blog where she is featuring Petal Parade also! LOVE her work! I am featuring Petal Parade this time, and I have to say that I got a lot more use out of it than I initially thought I would. This first card is one I made for a swap, and I was going for a monotone with a splash of gold look. Crisp Cantaloupe and Calypso Coral go together beautifully here, don't you think? On this card, I was playing around on some scraps of paper, and ended up really liking the way it turned out. The colors are Primrose Petals, Coastal Cabana, Pear Pizzazz, and Crushed Curry. I used Core'dinations for the embossed panel and rubbed my Gold Encore pad over the distressed embossing to give it a bit of "tarnish". How about using the Secret Garden framelits with this set? I did use the Secret Garden stamp for the Crushed Curry die cut flower, but the layer over that is the large round flower wet embossed with Pool Party embossing powder, then the center is colored with a blender pen, then it is cut out with one of the Secret Garden framelits. I love how the tine banners have the sentiment stamped on them. Those are from the newest photopolymer stamps sets: Countless Sayings I & II. No, those little banners are not punched with the new punch, but they sure could be! And the Decorative Dots embossing folder is another goodie from SAB. This is my favorite of these four cards, I love the colors! Love the variety of cards! 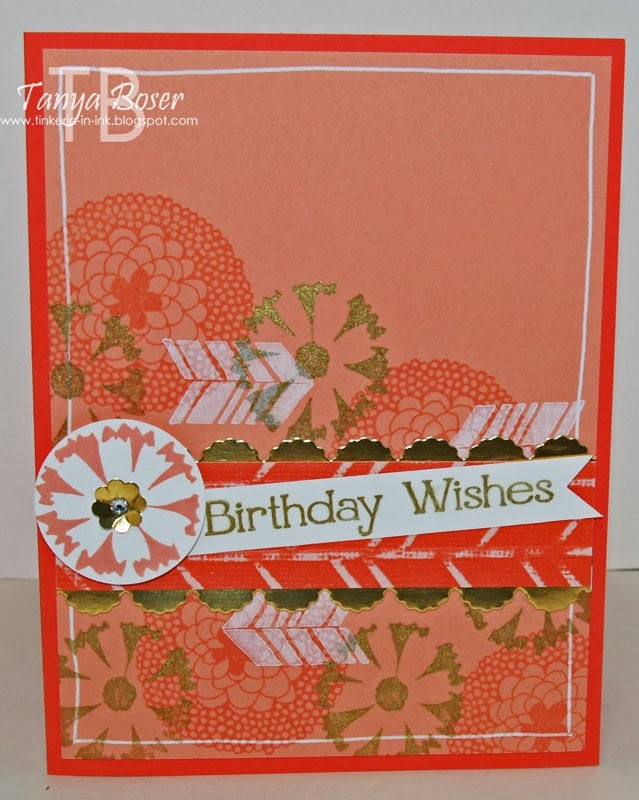 This set is a little deceptive; it takes on a whole new look with different colors and focus on one stamp. Great job! Great use of this set! You showed a lot of versatility with this set, more than I had envisioned. Love your cards! Wonderful projects! Love all the different color combos. Now I must get this set! 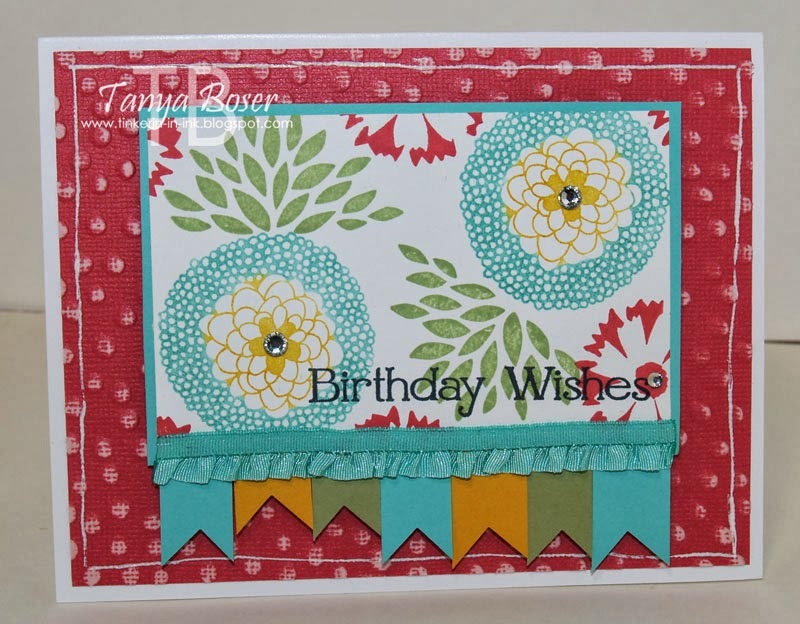 Love the brightness of your cards - I have seen lots of SAB in pastels and these cards of yours really pop with colour. Fantastic!! Great ideas for this stamp set. I love the top one with the gold embossing and gold foil paper. I've struggled trying to figure out what to do with this set. You hit it out of the park. Great projects! I love your great colors and designs...The coral and gold is wonderful! I love these!! You did a fantastic job as always!! I like the second one too it's just so different and cool! Love the bold colors! I especially like the Starfruit stamped banner on the third card-- that makes a lovely pattern! This is the hardest SAB set for me to envision so this is wonderful inspiration. Such a pretty variety of cards, Tanya. So pretty, I think the first one is my fav. 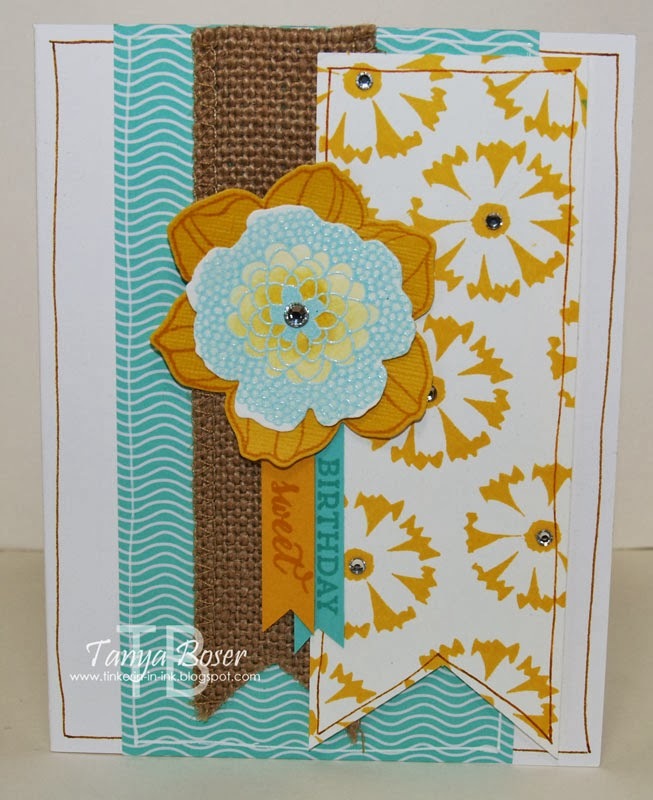 Love that pop of gold you added to your projects.. These are so cute!